The first time I saw Paul McCartney in concert was in 1993 at the Citrus Bowl in Orlando. I was 16 and, despite my youth, I considered myself as much of a Beatles fan as anyone else in that packed, cavernous stadium. Seldom am I starstruck, but when McCartney took the stage, Hofner in hand, a flood of iconography and lore—British Invasion… Abbey Road… Ed Sullivan… Shea Stadium... Sgt. Pepper… Lennon… Liverpool… A Hard Day’s Night—crystallized in my mind in that one moment, represented by that one man. “There he is!” I yelled to no one in particular, utterly gobsmacked. 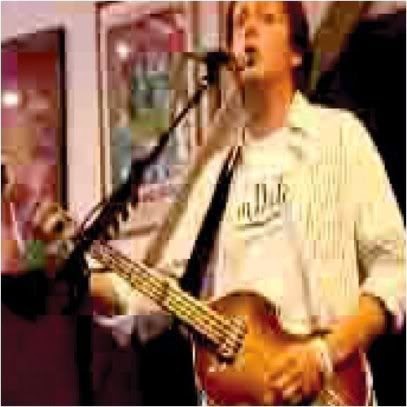 I can only imagine the euphoria felt by those crammed inside Amoeba Records in L.A. on June 27, 2007, rocking out as McCartney played within spitting distance of his own back catalog. Issued on CD and limited edition 12” vinyl, Amoeba’s Secret is this gig’s only officially available document. Sure, only four tracks appear on it—the set comprised 21 songs overall—but for fans who didn’t witness the performance firsthand (or snag a bootleg thereafter), this recording makes for a modest keepsake of rock ‘n’ roll’s ultimate in-store appearance. Yeah! Yeah! Yeah!